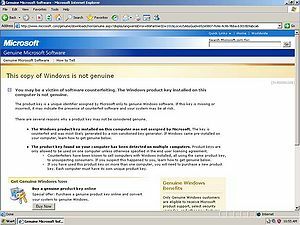 For those without comedic tastes, the so-called experts at Wikipedia have an article about Windows Genuine Advantage. Windows Genuine DisAdvantage® is a store loyalty card and a very rare form of spyware, providing real advantages for customers at MicroMart® and similar stores across the world. These and similar schemes are commonly known as "loyalty schemes" because they are used to obtain customer loyalty. Market reports say that WGA® is the most popular store loyalty card ever issued, with hundreds of millions of unhappy users around the world having demanded ActiveX™ compatibility so that they can install the transparent and easy-to-remove software onto their computers. Windows Genuinely Atrocious® is a program designed by Microsoft®. This program is designed to determine whether or not a system is a pirated copy or a legal copy. But that's what Bill Gates said "This program is designed to judge all computers as pirated copies". Even though they bought it legally, it also gives you annoying pop-ups, reminders, and a taskbar icon to remind you that your system is a pirated copy. It'll also make your system unavailable for important security updates from Microsoft®. The idea for WGA® was conceived after someone in marketing began to take the Tampera's song "If you buy this record your life will be better" too seriously and applied it to a software context. Early pitchbook style PointLess® presentations included the tag line "If you buy your Windows your software will run better" but this was removed from the final marketing literature as it was pointed out that this was an unfounded claim. Windows Genuinely Atrocious® works by secretly installing it while your not looking, Once installed, it will install a plugin for Internet Explorer™ that will make Windows Update™ think you're not Genuine™. It will then install itself on the system and make all these popups, reminders, and the taskbar icon appear. It will also make certain programs from Microsoft® uninstall, these include, but not limited to: beta programs, free software from Microsoft®, and even important service pack updates. Also included is the ability to phone home, yes, WGA® will phone Bill Gates's home every day, and it will send all your computer info, and even your personal particulars. Yes, you will be known to Microsoft®, and once you get a Genuine™ Key, you will have freedom. Once you enter a Genuine™ Key into your CD-Key slot, everything on your system will be fixed. WGA® also reveals new features available to Genuine™ customers, and WGA® lets you know that you'll eligible for security updates from Microsoft®. You'll also be able to download the latest beta software which will crash your computer, and get a key on a card which comes in 4-6 days. Once you get the card, you'll eligible for a lot of savings and offers available to Genuine™ customers. With being Genuine™ for a short period of time, you have a lot of advantages that will put you over the edge in service, quality, and excellence. Here is one of the many benefits you'll be getting from WGA®. Your system will be fixed - If you get a WGA® key, you'll be free of annoying features like firewalls and virus scanners. It can even set up your home page as the nastiest, knarliest pr0n site ever operated by Microsoft®. And as an added bonus, WGA® will automatically load everyone's favorite game: BSOD™!! Exclusive Updates - Now if hackers find a hole in the system, Microsoft® will rudely give you an update to fix that hole so that you may continue using their operating system. Exclusive Beta Software - Get the latest beta software which serves no purpose because you use other stuff like Windows Media Player™ 11 and Internet Explorer™ 7. Exclusive Offers - You'll get exclusive offers to many of your favorite places like McDonald's and Burger King. No Intrusion - Microsoft® will never ask for your information if you are Genuine™. Access to Genuine™ Sections - The card that you received in your mailbox will offer you entrance to the Genuine™ section of Microsoft® owned places like Microsoft Diner™ and more. Knowledge about your system - Now everyone on the Internet can receive your personal information which have freedom included free of charge! Receive offers from the most reputable sites. WGA® will send no information that can be used to identify you to Microsoft®. Your name, address or e-mail address will not be sent to them! Your credit card number, expiry date and PIN code. See here for a longer list. Your personal information will not be sold to 3rd parties unless they pay Microsoft® enough. Your privacy will be perfectly nonexistent. Here at Microsoft®, we're making it easy for you to be Genuine™. We're committed to making you safe from hackers and also prevent piracy. At Microsoft®, we want all people to be Genuine™ and here's how. Once you follow all the instructions, you'll enjoy the benefits of being an idiot of being a Genuine™ customer plus more freedom to do what you do. You deserve to be Genuine™ and so do all our customers. We're Microsoft®, and we're changing the world to a more horrible place. So as you Genuine™ customers know, you signed up for being Genuine™ and are pretty pleased with yourself. Well, we at Microsoft® are doing something big for you. Microsoft® is ready to reveal what none of you have seen before. Ladies and gentlemen, introducing WGA+®. WGA+® is for those villains that want to rule the world. You'll gain exclusive programs that help destroy systems that help retrieve information to the world's greatest "heavily guarded" treasures, and that help cause natural disturbances all around Earth. You'll also receive major discounts at the Microsoft Diner™, PLUS FREE WINE! And you'll receive special cooperation with Microsoft®, and you'll also receive free equipment that will help you rule the world as you villains call it. This page was last edited on 12 March 2012, at 20:36.